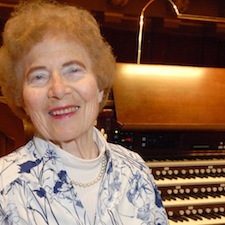 Marilyn Mason, University organist and co-chair of the Department of Organ, just completed her 66th year at the University of Michigan, making her U-M’s longest-serving faculty member. In honor of this remarkable achievement, a few of Marilyn’s colleagues and former students have provided reflections on her life and legacy. Sixty-six years seems too little time for anyone to achieve all that Marilyn has. She has elevated our organ department to international preeminence, bringing the best students to Michigan and placing graduates in the top academic and church music positions nationally. She has performed and recorded throughout the world; commissioned more than 75 works for organ; organized conferences, institutes, and seminars; led historic organ tours; promoted installations of superb new organs; built our scholarship endowment; and supported many projects with her own generosity. Through it all, she has found and unlocked her students’ potential and guided their professional development with wisdom, humor, and unshakeable loyalty. I was a member of Marilyn’s first organ class in September 1947 (though not as an organ major), and the first thing she said was, “Here! Bring this to your first lesson.” Then she let out a big chuckle and handed me the Schoenberg Variations on a Recitative, which she would soon play for the composer himself. Many years later, I learned and played it several times, in obvious emulation of Marilyn—as I did with so many other things. Marilyn’s fame has continued for decades, but I believe her reign as the “Queen of the Organ World” first reached its true heights in the early '60s. Thousands flocked to hear her thrilling concerts, and hundreds of aspiring young organists who wanted to study with her had to be turned away because her studio was overflowing with students. Marilyn Mason is not only a teacher of music, but also a teacher of life. She offers scholarly, interpretative, and always inspiring advice on any work that we bring to our lessons. From her we learn to go beyond the notes on the page into the music itself, into the mind of the composer, making the final recital performance an exciting, mutually satisfying dialogue between audience and performer. Her knowledge of registration is phenomenal. Her musicianship is extraordinary. Her energy pervades every phase of her life and ours! Marilyn once told me that she does not want to produce "cookie-cutter" duplicates of herself, but rather to inspire her students to think for themselves. As I reflect now on my teaching, both at the pre-K and the postgraduate level, I realize that these words have guided me in my career. In reality, Dr. Mason has never "taught" a day in her life! Rather, she has discovered, guided, and unlocked the talent and potential in every single person that she has met. She inspires not only musicians, but every individual that she has ever encountered to dig deep within themselves and be the best that they can be. That is what makes a teacher! High energy, determination, and a heavy dose of creativity have taken Marilyn in the direction of "firsts." Her ideas have infused musical light and life into all of our lives. In a stunning display of inventiveness, she ordered the complete organ works of J. S. Bach to be photographed and put on slides so that the musical notes could be shown to the audience while she performed all of the works during the 300th anniversary of Bach's birth in 1985. In 2007, Marilyn was dealing with a personal health issue, and more than once she came into meetings looking like she hadn't slept in a week. But...once she got into the music she was a completely different person. The music, the organ, the hall all played their part in enlivening her. She knew the music like the back of her hand, and her 60 years of playing the Hill organ proved to be invaluable to me and my performance. She knows that instrument so very well; it fits her like a perfectly tailored glove. During my final years of teaching at the University of New Orleans, I also served the music department as acting chair and then co-chair. When faced with the many daily challenges and decisions required by that job, I often asked myself how Marilyn would react to the frequently thorny situations that presented themselves. Her vast understanding of human nature, coupled with her realistic view of the world, which she imparted to all of us, helped me successfully navigate the land of academia. It is therefore not a surprise that, in addition to many prominent concert and church organists, she has also produced a goodly number of department chairs, deans, and even university presidents. Quintessential Marilyn: writing in our scores with the characteristic dull blue pencil, things like "direction" and "sweep," "control rather than speed," "the silence of articulation"—all of these tips and more. We, who have had the good fortune to study with her and enter into Marilyn's amazing mind, have been changed forever, both in musical performance and in life lessons. I arrived at U-M as a very nervous young kid from Rockford, Illinois to work on a master’s degree with this internationally renowned organist. Within my first year I had the opportunity to perform concerts in France with Marilyn and my fellow grad students. I learned the music of Messiaen, Bach, and Jongen, realizing that practicing was fun and hard, but the end result was worth the work. Marilyn opened my eyes to music as never before. The questions were there for me to answer and the possibilities were there for me to grow into. The blue pencil was never far from the console and lessons, and to this day I still have all the music with her markings for my students to continue their learning process. My memories of Marilyn are: a lifelong mentor to her students; a compulsive joke teller; annual gifts of premium gin; and ending most conferences in the dean's office with a prayer. Marilyn has to be one of the best joke and storytellers who ever lived! Wherever she went around the world, Marilyn collected wonderful jokes, and to be sure she didn't forget a single one, she kept a "little black book" with reminders of assorted punch lines. Once, in New York, her purse was stolen. The only thing that really upset her about it was the loss of the little black book. Needless to say, she very quickly replaced it! My favorite quote from Marilyn is: "You know, I had finished playing a recital and was speaking with a woman at the reception. The woman commented on how lucky I was with my career. I smiled and thanked her, then I turned to my host and said, 'Funny, the harder I work the luckier I get!'" I remember the reams of correspondence that were always present in Marilyn’s studio; she exercised great care in answering each and every letter and phone call, no matter who wrote or called. At one of the dedication recitals of the organ in her studio, Marilyn was dressed in her distinctive performing outfit of the '70s: dress with full skirt so that it could drape over the back of the bench as she played. Noticing that the pedals were not slippery enough, she brought out some wax, got down on her hands and knees, and quickly but expertly waxed the pedals in order to allow her feet to slide more easily! In her 66 years of total dedication to her beloved University of Michigan, I imagine Marilyn has taught well over 1,000 organ majors, and they have in turn produced additional organ majors and church musicians…and so the legend will continue for time immemorial. Like many of her former students, I claim Marilyn Mason as one of the most important people in my life. I look forward to enjoying her for many more years as mentor, colleague, and friend. For seven decades, Marilyn Mason has distinguished our School with her exceptional artistry and pedagogy. In addition to Marilyn’s legendary studio teaching, her annual historic tours to Europe—which she led for well over 50 years—provided students with thrilling opportunities to hear and play the great organs of the world. Her dedication is unparalleled, and continues into perpetuity through generous endowed scholarships and the establishment of the Marilyn Mason Professorship in Organ, which will be created through a gift from her estate. Her impact on the School of Music, Theatre & Dance will be felt for years to come.